Wow, a cool new app has reared its head (but, for iOS only, boo!) and it's rather nifty if you're out and about in Manchester. The Manchester Walking Tours app has been created by magneticNorth as a prototype of new technology devised by Under the Paving Stones and was developed in conjunction with Manchester City Council, NOMA (the latest new quarter of the city centre) and The Co-operative Group (major land owners in Manchester). It's a "visitors app" like no other because once you begin the tour, the phone pops back into your pocket and you experience your surroundings with your head up and not looking at a screen! 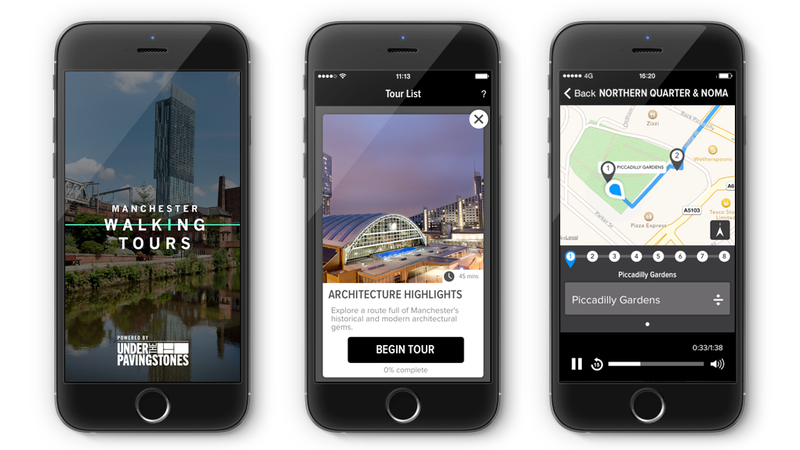 Instead, GPS tracks your location and audio guides tell you more about what you're seeing, in real-time, based on information from Manchester's city archives. Go explore the city that appeared in New York Times' Top 52 Places to Visit in 2015 list!